This letter is Authorized by Abacus Data. CPC wins on security, struggling on economy. As we’ve passed the mid-point in the campaign, parties have announced many parts of their platforms. We thought it would be useful to see how the parties were faring in terms of establishing policy credentials. • The Conservative Party edges out the other parties, by a wide margin, when it comes to combating terrorism and dealing with ISIS. 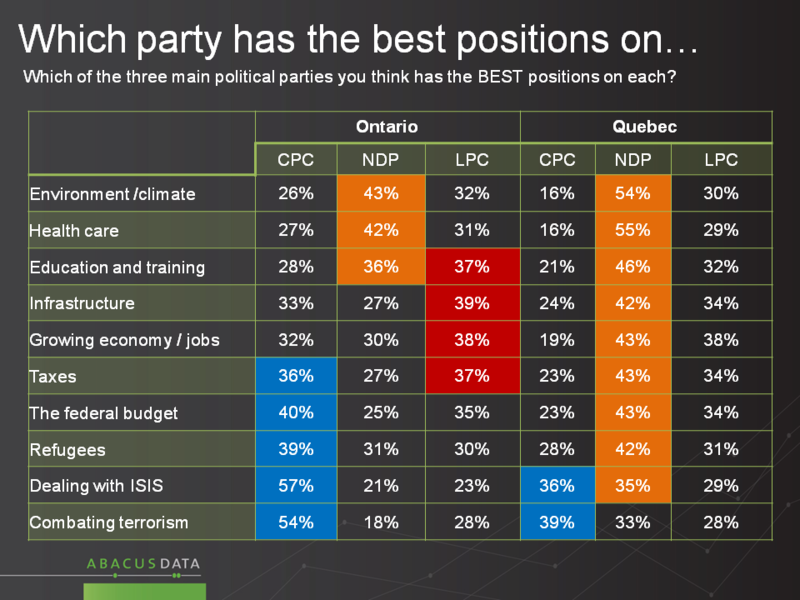 In each case roughly half of all voters say the CPC has the best position. The Conservatives have a notably more narrow advantage when it comes to the federal budget, ahead of the Liberals by only 3 points, with the NDP a couple more points back. The weakest results for the Conservatives are for education and training, health care, and the environment/climate change. • The NDP is ahead when it comes to education and training, health care and the environment/climate change. In each case, on these items, the Conservatives are third. The weakest results for the NDP are on taxes, the budget, growing the economy, and infrastructure. • The Liberal Party edges out other parties on taxes, infrastructure, growing the economy and creating jobs. The weakest results for the Liberals are on terrorism and ISIS, although they trail the NDP by a large margin on health care and the environment as well. Because this election is starting to turn into a series of regional races, each with their own dynamic, we felt it would be useful to compare the results in the two largest provinces (where sample sizes are large enough to improve reliability. • The NDP leads on 8 of 10 issues, trailing only on terrorism. In every case but on the terrorism issue, the Liberal Party is second, and the CPC is third. • The NDP advantage over the Liberals is largest on the environment (24 points), and smallest on growing the economy/creating jobs (5 points). • The Conservatives are weakest on the environment, health care, and economic growth/job creation. 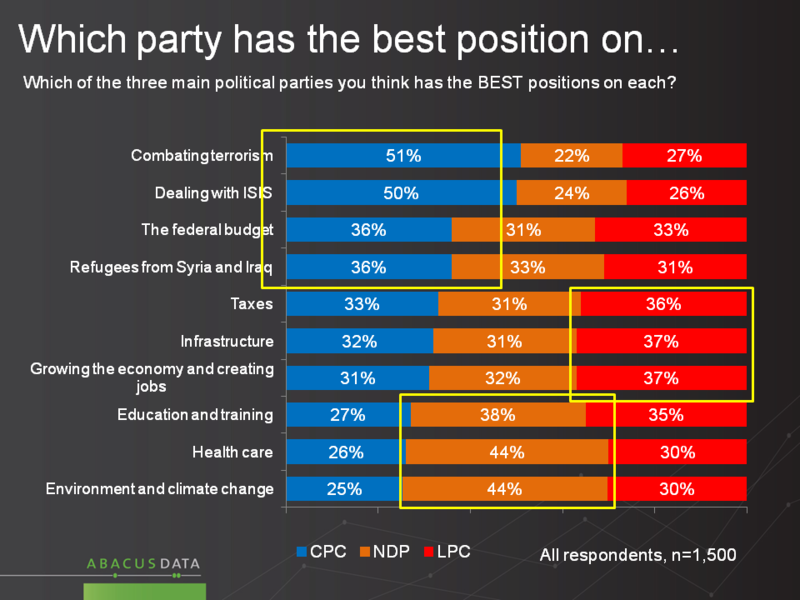 • The NDP lead on just 2 items (environment, health care) and are tied with the Liberals on education and training. • The Conservatives lead on 4 items ISIS, terrorism, refugees, and the federal budget. Their advantage is 25 points on the terror/ISIS items but only 5 points over the Liberals on the federal budget. • The Liberals in addition to tying for the lead on taxes and education, have an outright lead on infrastructure and economic growth. • The Conservatives and Liberals are tied when it comes to taxes, both ahead of the NDP by about 10 points. First, the platforms are having some impact on public opinion. The most apparent example is that the Liberals were not as competitive on economic growth and infrastructure before the campaign began. The Conservatives have taken a more cautious line than the other parties when it comes to refugees from Syria and Iraq, a position that probably strengthens their political standing among their accessible voters a little bit, even if it makes other voters more likely to vote for a different party. Outside of Quebec, the NDP are a more vulnerable on economic growth and jobs than on any other issue. Arguably, this is the worst issue to be vulnerable on. The Liberals seem more competitive in these numbers, especially on economic issues, and will take heart in their advantages over the NDP in Ontario. Finally, for the Conservatives, their strongest suit is the security/terror issue set, but they have been less successful at convincing voters (especially in the two largest provinces) that they are a superior choice on economic, tax or fiscal matters. In each case, they find few voters giving them credit for the way things are today, and more voters imagining that other parties could do just as well or in some cases better. Our survey, commissioned by Abacus Data, was conducted online with 1,500 Canadians aged 18 and over from September 9 to 11, 2015. A random sample of panelists was invited to complete the survey from a large representative panel of over 500,000 Canadians, recruited and managed by Research Now, one of the world’s leading provider of online research samples.